The Home/Rescue Large structure is a house on one side and a fire truck on the other. 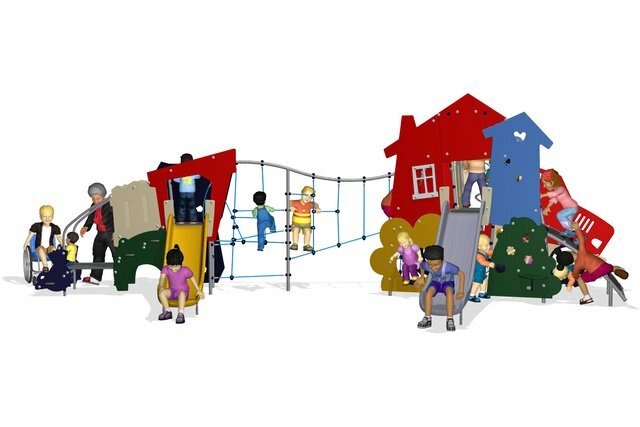 The three-dimensional climbing net links the home and fire truck with a satellite tower which serves to expand the play possibilities even further. At the satellite tower there is a fun slide and small places for exploring underneath. The climb across the linking net encourages fundamental loco-motor skill that involves ascending and descending movements. Children will be delighted to find two hidden spaces underneath the structure where they can move in with a family or a crew of firefighters. The smaller space under the climbing wall serves as an interesting place to watch the world go by. The larger holes encourage children to use their whole body when climbing through - both in and out. These whole body movements encourage development of children's movement planning abilities, flexibility, and an understanding of their growing bodies in relation to space.